The former U.S. housing secretary and San Antonio mayor took another step toward a 2020 presidential run Wednesday. SAN ANTONIO – Julián Castro is taking another step toward a 2020 presidential campaign. The former housing secretary and San Antonio mayor announced Wednesday that he has formed an exploratory committee, Julián for the Future, to consider a bid and will make an announcement Jan. 12 in San Antonio. Castro has made little secret of his intentions, saying in recent weeks that he is likely to join what is expected to be a crowded field for the Democratic presidential nomination. "I'm definitely leaning a certain direction," Castro said with a laugh while speaking with reporters Wednesday afternoon inside his San Antonio home. "You guys gotta give me a little mystery here." Castro may not be the only Texan who ends up in the race to unseat Republican President Donald Trump. U.S. Rep. Beto O'Rourke of El Paso is being urged to run after his closer-than-expected November race against U.S. Sen. Ted Cruz, R-Texas. And O'Rourke has loomed large over Castro's 2020 preparations in recent weeks. Castro has been getting ready for a potential run for nearly two years, traveling the country to support midterm candidates and doling out contributions through his Opportunity First PAC. The exploratory committee will allow him to raise money to test the waters, though it is typically a formality on the way to officially running. On Wednesday morning, Castro released a video message highlighting his family's story. His grandmother came to America when she was 7 years old and "just two generations later" Castro became a member of President Barack Obama's cabinet while his twin brother, Joaquin, serves in Congress. Julián Castro said he'd spend the next few weeks "talking to folks" before he makes an announcement. "I never thought when I was growing up on the west side of San Antonio that I'd be speaking to you today about this," he said. "My name is Julián Castro, and I know the promise of America." Castro would be among the first candidates to officially enter the 2020 primary, and polls show he would be starting out toward the back of the pack. Castro on Wednesday brushed off the notion he was trying to get ahead of other prospective candidates, saying he was "gonna go on my own timeline." And he expressed no concern about his initial long odds. While Castro's candidacy has been long expected, intense speculation has recently centered on O'Rourke. The El Paso congressman said during his Senate campaign that he would not run for president in 2020 but has since admitted he is not ruling anything out. 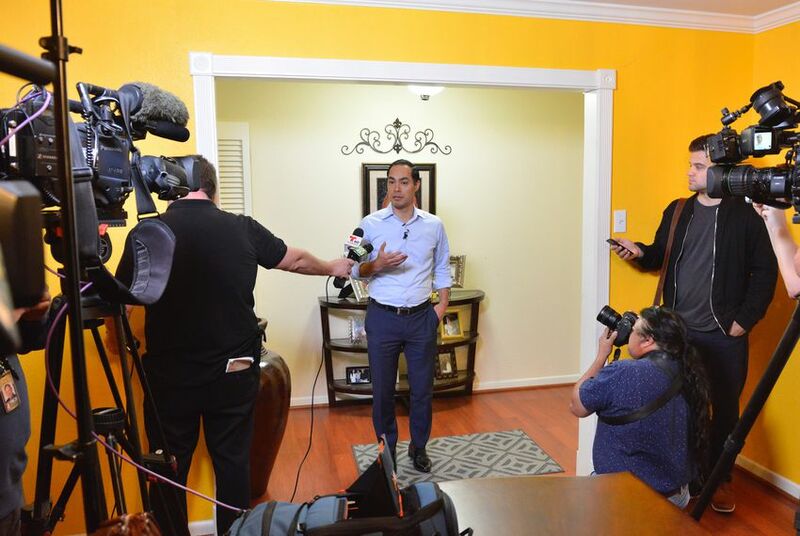 Castro has said O'Rourke's potential candidacy does not affect his plans, and in media interviews Wednesday, Castro spoke positively of the El Paso congressman. Asked at his home why Democrats should get behind him versus O'Rourke, Castro did not offer a direct contrast but laid out a general choice for the primary. "I think when people look around, they’re gonna look for somebody who has a strong vision for the country’s future and that has actually shown they can get things done, and I have," Castro said. Castro did say he would not accept PAC money if he runs for president. O'Rourke's rejection of such contributions was a hallmark of his Senate bid. More broadly, Democrats are mulling the extent to which they want to turn away from big money in politics as the 2020 primary gets underway. Castro served as secretary of the U.S. Department of Housing and Urban Development from 2014 to 2017, a period during which Hillary Clinton considered him as a potential running mate but ultimately went with U.S. Sen. Tim Kaine of Virginia. Prior to joining Obama's Cabinet, Castro was mayor of San Antonio for five years.